Seeing the KP in action—or, in this case, inaction—has given me an understanding why people have grown so frustrated and disappointed in it. What started as a serious effort to save lives has become a spectacle. To be fair, some of this haggling is the nature of the beast. The KP requires consensus be achieved among 72 governments. It is difficult to get 72 people to agree on anything—never mind 72 governments. And ultimately the industry can’t just rely on the KP, and those 72 unpredictable governments, to chart its future. It needs to take matters more into its hands. I still support the KP—not because it helps consumer confidence in the industry, because I am not convinced it does. I believe the KP is the right thing to do, because uncontrolled diamond sales can lead to some horrible things. It has even proved its worth this year, leading to a marked improvement in the situation in Marange. But all that is in jeopardy now, and if the KP does fall apart, it will be difficult to re-create. With “traditional definition” conflict diamonds basically history, there isn’t going to be much political will to construct an international gemstone certification scheme. Now, while I “attended” the KP Plenary in Jerusalem, I didn’t go to any of the meetings; they were closed to the press. Apparently, at the closing session, I missed some truly insane stuff, with the U.S. flayed for imperialism and the KP chair having to prevent countries from walking out. 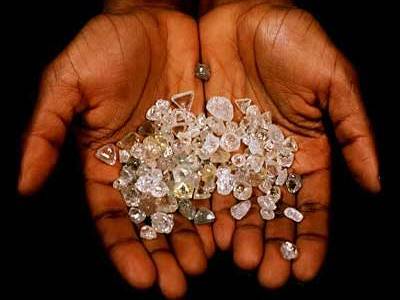 Once the Plenary ended, Zimbabwe’s mining minister, Obert Mpofu, kept things interesting by declaring at a press conference that Marange diamonds had been cleared for export. This puzzled the assembled reporters, who had spent the last half hour hearing there was in fact no deal. Oh no, the minister declared: A proposal had been put before the Plenary. No one objected. Which, in his world, meant: It was approved. Later, of course, KP chairman Boaz Hirsch explicitly contradicted this. However, it may have been noteworthy that Mpofu said that Zimbabwe would only be exporting from KP-compliant mines Mbada and Canadille, and not the rest of Marange. Which, truthfully, not many people do object to. The irony here is, if you discount the Zimbabwe mess, there are some glimmers of hope for the KP’s future. The KP will finally establish a permanent staff, to ensure more continuity between the rotating chairs. There is also a new enforcement mechanism. These are important achievements that were top priorities of Hirsch, who is given good grades for his tenure, as tumultuous as it was. The NGOs and the industry also agreed on “human rights language.” While this was ultimately blocked by a group of countries, it is likely to come up again, and there is optimism about it passing. “Human rights” are already mentioned in the KP Preamble. Even so, adding this language is viewed by some as a pretty significant expansion of the KP charter, that could lead to further controversies like the one we are seeing over Zimbabwe. Angola, in particular, was just rapped in a Wall Street Journal article for the treatment of diggers by mine security forces. Now, if all this turmoil results in a cleaner supply chain, it will have all been worth it. But one wonders whether the KP can survive many more rides on this roller coaster. Diamonds – What on earth is going on?